Much of the information in this book I already knew. Unfortunately, many of the solutions Walker offers to are very progressive in nature, which, in my opinion, are the problems facing the nation today. If all men are created equal, why must gov't impose progressive taxes, regulations, etc? And I'm firmly in the lower-middle class. Needless to say, I found the "solution" portion of the book to be very lacking and very evident that it was written by someone who's been in government much too long. 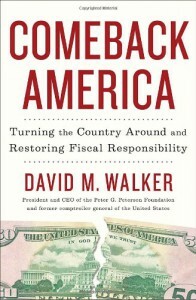 I have much more faith in the American people than Mr. Walker. I don't believe that social security is something that people depend on and need. Rather, I believe it is yet another freedom taken from us by government that is then messed around with and regurgitated back to us as something much less valuable than what the private sector could have given us or, better yet, what we could have used the money to create. Society doesn't get smarter by the government taking over things for them, it gets dumber... and, in turn, society then turns to the government for solutions. We got through the Great Depression without the government, what makes us think that we need them to solve anything... especially problems they, themselves, created for all of US.